One of the main frustrations that beginners to the beautiful game of golf experience are maintaining a consistent round and knowing the distance to the green is one of the main ways of saving shots. Using a golf GPS watch or rangefinder will enhance a round and help to reduce a handicap. Well, as with most things nowadays, technology is playing a part and there are now an array of devices available to help with the main choice being between a handheld rangefinder or a GPS device to establish distance. More information on the Garmin X40 here. 1.2 A Golf GPS Watch or Rangefinder?? A standard set of golf clubs are made up of the driver, 3 wood, 5 wood, Putter and irons including sand wedge, pitching wedge, and irons numbered 9 down to 2. The rules state that a maximum 14 clubs should be carried which leads to a myriad of options depending on your playing ability. Each golf club manufacturer is fighting for market share and every year there is something new, ranging from rescue woods to open-faced lofted wedges. But at the end of the day, a player needs to know how far he or she can hit with each club and this is where a distancing device can come in to help build confidence. A good starting point is to practice with each club at the driving range where you will find distance markers to give you an indication on how far you hit a particular club. There is a lot of information available stating that a 6 iron to 150 yards or a 4 iron to 185 yards but this should be ignored as each golfer is an individual. A beginner might be put off the game trying to live up to these standards, remember the phrase ‘ It’s not how! It’s how many’, meaning ‘play within yourself’, the distance will come as you get more confident with your game. 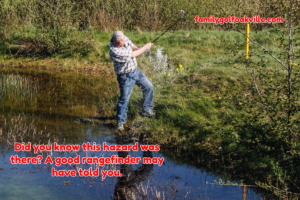 As you practice you will become more familiar with the distances for each club and this is when you need to consider a rangefinder device which will really help to reduce your handicap and build your confidence. Knowing you are 120 yards away from the pin rather than guessing gives the confidence needed to follow through and complete the shot. A Golf GPS Watch or Rangefinder?? The two main types available of yardage finders are a GPS system that can be combined as a watch to wear on the wrist or a handheld rangefinder that is controlled by laser. Each has pro’s and con’s in far as performance, ease of use, and cost. For more information on the benefits. The GPS watch will provide you with a choice of course and you can download the particular one that you are playing. Each hole appears on the watch face as you approach it, and will hi-light any upcoming hazards as well as giving you the remaining distance to the green or to the target area you are playing to. The golf rangefinder is a handheld device which you look through as you would a telescope picking up the top of the flagpole. This device is much more accurate giving readings to within a yard. Some of the later models also have incorporated ‘slope indicators’ which will give you distances allowing for the declines or inclines in front of the target. Once you are familiar with the distances you hit your favorite clubs you may well find a yardage finder, whether it be GPS or rangefinder will become a must-have accessory to every visit to the golf course.